I clicked and read that one of the students in my Writing for Mass Communication lab was writing to let me know she had gotten an internship with Sony Music Entertainment — and that the intership was paid. Not only is it great news that she got the internship and in one of her interest areas (music) but because she is going to be paid for her work. Her e-mail reminded me of an article I’d read last month in the New York Times — The Unpaid Intern, Legal or Not. The story was about the trend of businesses and organizations having student interns working for them, but many of those internships were unpaid. Federal regulators are investigating the legality of having college students working for no pay and if those unpaid college interns are putting potential employees out of work. In the communications field, we are finding fewer internships are paid. Students often spend 30 to 40 hours a week for 12 to 15 weeks on their internships. But they may receive no pay. Some students have to relocate for the summer, moving to the internship location and paying for housing, in addition to not being paid. Some internships require the students to have their own cars. And some internships require that the student be enrolled for college internship credit. So the student must pay tuition for the opportunity to work in the internship — perhaps for no pay. Businesses have their reasons for wanting students to be taking the internship for credit. In UF’s College of Journalism and Communications, a student can’t enroll for internship credit without having a certain number of courses in the college. That provides a kind of quality control for the business hiring an intern. Also, if the student is enrolled in internship credit, the student can’t just walk away from the internship, which can leave the business shorthanded. Students are eager to have internships. Those internships help them develop and try out their skills. They are immersed in the job environment and can see how well the job duties, the work lifestyle and the job’s ethics match with their own. They can develop their portfolios. And they can develop what often is essential to obtaining the paying job when they graduate — contacts in the field who might be able to hire them or who can serve as references. 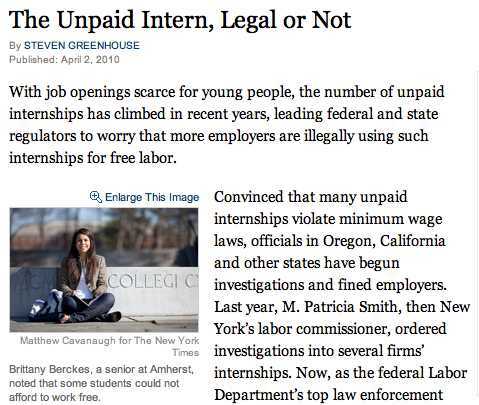 For some students, paying tuition to take an unpaid internship isn’t a problem. Some even can afford to move to an internship location for the summer. But for other college students, they must be working for pay. They don’t have the family resources or don’t want to take on more student loan debt to finance their unpaid internship. When I clicked on the NYT story again today, I saw that the story has 279 comments. And you can see why. This is a topic with multiple viewpoints. I’d be interested in your experience — as a faculty member or college student — with internships.